Stories about the pursuit of urban yolks. 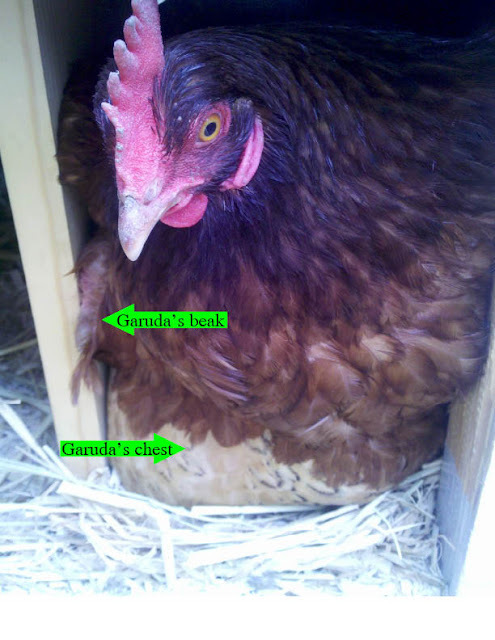 As promised, I thought I'd share about the wonderful world of chicken leisure activities. The ladies get bored from time to time just scratching the dirt and straw all over our yard, so it's important to provide outlets of entertainment, lest they remember that they make tasty snacks. I've compiled a step-by-step guide to making a cabbage tether ball, that the chickens gleefully volley back and forth in the run, catching small mouthfuls with each peck. Step 1: Get a medium head of cabbage (green or purple*), and slice it in half. *purple cabbage, used with varying success to dye Easter eggs, imparts a blue pigment to various types of matter. Step 2: Use a chopstick or other pointed object to pierce a hole in the cabbage. Alternately, Mr. Baker likes to drill though a whole cabbage using a long drill bit. Step 3: You'll want to feed a string through the cabbage in order to tie it up. Shove a straw through the hole and create a passage through which you'll feed the string. Remove the straw while keeping the string fed through, and tie the string around the cabbage, knotting the ends together. Step 4: Tie the cabbage up to the top of the chicken run, and get ready for hours of chicken amusement. Several hours later you'll find nothing more than a cabbage nub. Coming soon, Mr. Baker has video footage of the buffoonery. Stay tuned. One at a time ladies. One at a time. I'm happy to report that Garuda and R.E.D. have been getting along much better. 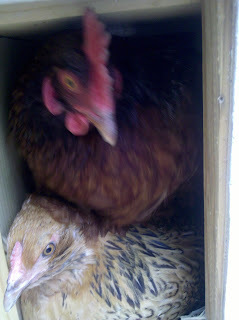 Today I opened the back hatch to the nest box to find this silliness, and felt it was necessary to share. Apparently, when you've got to lay, you've got to lay. I'm guessing that Garuda got to the nest box first this morning. R.E.D. may have been crowning and decided that if she couldn't beat her, she'd join her. They seemed pretty comfy in the 10"x 10"x 10" nest box, and seemed unimpressed and completely disinterested in vacant nest box to their left. Cuddle puddle! I have some disturbing news to report regarding egg production: It appears that the chickens have discovered that they create their own tasty treats. We theorized at length about the disrupted production. We'd seen an errant feather here or there. Were they starting their yearly molt we'd heard so much about? Surely not. Most of the literature clocks the molt to happen around fall/winter (at which time, we will surely submit photos to this contest). Mr. Baker and I'd seen the chickens (well mostly Checkers, that troublemaker) rolling the eggs out of the nest from time to time, and thought little of it. Then, one terrible day, I walked out to the coop to find shards of egg shells in the run area with the ladies remorselessly smacking their beaks, braying for more treats. They'd discovered what we've known all along: they produce tasty snacks. Since then, we've employed some modest approaches to squelching their negative behavior. I knew they were beyond most behavioral training and therapeutic techniques I'm familiar with in my day job (cognitive behavior therapy? solution-focused? electroshock?? ), so we looked to the internets for guidance where we discovered that they probably needed more protein and/or calcium. We'd recently bought our second bag of layer pellets, and apparently the ladies were not having the new brand, so Mr. Baker trekked across the greater bay area to find the preferred pellets. Since the hens have constant access to high-protein pellets and oyster shells for calcium, we tried adding some gourmet supplements to these staples. Long blogpost short, we essentially started spoiling the little brats to bribe them into saving their eggs for us. Alas, the remainder of the month was spotty still (though sixty-five eggs in May is nothing to sniff at). Mr. Baker is a Negative Nancy, insisting that every day we get less than full production is a day of chicken cannibalism. I'm more optimistic that their slowed production is simply in protest to the cold weather (clearly summer has forgotten about San Francisco this year). At any rate, humans have still done far more disturbing things with the dregs of the reproductive process, as seen here. *Actual number may have been greater. **We were on vacay and our chicken-sitters were not required to keep track of production.